then it’s something that needs to be addressed,” she said. Henry pointed out that the systemic barriers have historical roots. Bus Coordinator for Waterloo Region, and Slavery became outlawed in Society CanadaWawhen works for the Canadian Cancer BritainWellington. abolished itCooper in 1834. said one of the terloo number one questions she gets askedofis why Despite the implementation public the Canadianwhich Cancerwas Society would part education, offered to be everyone ofregardless a walkingoftoreligion schoolor program. race, in 1842 Colchester, “They might not seem connected, buthad theyone the southernmost settlement in Canada, are,” Cooper said. of the first segregated schools in the province. She thatCommon nine percent of CanadiByexplained 1850, the School Act was anamended childrentodo not get enough exercise, and allow for the creation of segregated that inactivity has been linked to a higher schools and it remained in effect until 1965. risk of some was sortsthe of last cancers. Colchester segregated school to be “We want to develop habits at an early age closed that year. thatHenry children take into adulthood,” she gavewill examples of early correspondence said Prior to working on this program, Cooon the issue of education of Black children, per was a Public Health Nurse for 30 years. segregation, and of Black parents fighting for a Cooper said some parents think that bebettertheir education for their children. cause kids play a sport they are active She said it’s important thatthem the curriculum enough, but she said teaching to walk incorporates a wide range of stories on the or to cycle to get around is a lifelong physical African-Canadian experience into all classrooms. activity. “It’s important Blackthat students see that, She said researchforshows beingtooutside but it’s important for all students to see that these has a calming effect and reduces anxiety, stories are included,” said Henry. which helps with a child’s mental health. Thisit also year,builds Blackindependence, History month was And as chilcommemorated by Canada Post with a stamp dren often meet their neighbours on the recognizing Jackson as the Black walk and learnAlbert their way around theirfirst neighpostal carrier in 1882. Jackson was born into bourhood. Hills Public School walk leaders Caroline Nichols and Randi St. Laurent, “There inis the a social walking and toChicopee slavery Unitedaspect States to before escaping with her daughter Claire, prepare to lead a group of children on their daily walk Ontario Black History Society President and Peel District School Board you don’twith get that in a car,” Cooper said. Canada family. to school. ...continued on page 5 of Henry pointed out that the local newspaper educator Natasha Henry (left) with Pauline Janke, vice-principal Submitted Photo Waterloo Collegiate Institute, at a presentation at the Waterloo Region began carrying stories of white co-workers Photo by Irene Schmidt-Adeney ...continued on page 2 District School Board. natal support programs. “Our centre will develop early learning programs associated with traditional and land-based wisdoms and skills,” said Stephen Jackson, CEO of Anishnabeg Outreach, the organization that manages and operates the centre. “For this we will rely on the guidance of Indigenous Elders, Knowledge Keepers and educators.” The programs may include teaching about smudging ceremonies, preparing Indigenous food, making dream catchers, making moccasins, teaching Indigenous languages and traditional medicine. In only six months, the former church was totally transformed thorough the hard work and resourcefulness of many volunteers including Jackson who personally put in hundreds of hours of labour to ensure that the time-line conditions for the nearly $100,000 in grant money the project received from the Region of Waterloo would be met. The Region of Waterloo’s first Indigenous child and family centre includes a large livingroom area where children and parents can meet others, read together or play games. It is decrorated with metal tree sculptures, a limestone wall and art created by the centre’s CEO Stephen Jackson. font is now used in the centre’s smudging ceremonies, and the alter table will eventually be used to display a refurbished cedar strip canoe. Designed to bring the outdoors in, the church’s former cinderblock walls are covered with an ascetically pleasing and calming combination of limestone bricks, cedar planks and decorative copper (a sacred metal to Indigenous people). Jackson said they also plan to plant a garden in a side yard and an orchard in the front yard. “We hope it feels like home,” Jackson said. The former church sanctuary, still being renovated, will become the center’s grand gathering room. The center also offers a fully functional kitchen were cooking classes and communal meals will take place. There is a large living room space where adults can gather to talk as their children play close by in one of several play areas, or a place where parents can read to their children. Seeking Piano Instructors The Stanley Park Community Association is seeking Piano Instructor(s) to teach individual 30-minute piano lessons to both children and adults weekday evenings (Wednesday and Thursday) between 4:00 and 9:00 pm. does not run during July and August but starts up again during each of our Fall (September), Winter (January) and Spring (April) sessions. Must be 18 years of age or older and must have a valid Police Record Check. We are also seeking Substitute Instructors to be on call (Tuesday to Thursday) in the event instructors are not available. several individuals most knowledgeable about their particular Carnegie building. One actually owns the building. While travelling from site to site, specialists on board will relate details of Carnegie’s life, his funding program and the various libraries visited. This day-long adventure starts and returns to Fairview Park Mall and includes lunch. Though all buildings are accessible, guests must be able to walk short distances and climb steps as needed. For more information contact the ACO North Waterloo Region Branch at:communications.aco.nwrb@gmail. com. The cost is $60 per person. For registration and payment go to Evenbrite and search for Bus Tour of Carnegie Libraries. Kitchener was once home to a Carnegie library when the city was known as Berlin, Ontario. The Carnegie funded Berlin Public Library opened on January 8, 1904 at the southwest corner of Queen Street North and Weber Street. The library remained at that location for 58 years. In May 1962, the new Main Library was opened on Queen Street North, on the opposite corner of the intersection. The original Carnegie Library building was then demolished. Eight Carnegie Libraries were built in Waterloo Region, including the Ayr Carnegie Library, Elmira Carnegie Library, Galt Carnegie Library, Hespeler Carnegie Library, Kitchener Carnegie Library, New Hamburg Carnegie Library, Preston Carnegie Library, and the Waterloo Carnegie Library. William James Scott (1812-1882) was New Hamburg’s first postmaster from 1851 to 1857. He was also a member of the first council of Wilmot Township and the first Waterloo County Council. In 1858, Scott was elected as an Independent Conservative member of the provincial parliament, representing South Waterloo. Visit the Hall of Fame exhibits located on the second floor of the Ken Seiling Waterloo Region Museum. Journey to Space takes visitors as close to being in space as one can get from Earth. PD Day Fun - Astronaut Training Friday, April 12 Explore the Journey to Space exhibit. Family Fun Easter Themed Weekend April 19 to 22 Enjoy Easter themed activities including crafts and games. Easter Egg Hunt Saturday, April 20, 10 a.m. Workshop: Historic Cooking - Lunch on (Historic House opens at noon) $2 per child. Ages up to eight years old. the Woodstove Saturday, April 27, 10:30 a.m. to 1:30 p.m. Bring your own basket and collect coloured eggs scattered around the $35 per person plus HST. Includes food site. Exchange eggs for a sweet treat. and recipe to take home. For special event details visit our websites. www.regionofwaterloo.ca/museums The Carnegie Public Library building in Ayr was sold after a new regional library was built. NATURE ROOM - Stephen Jackson, CEO of the newly-opened Anishnabeg Outreach Child and Family Centre in Kitchener, stands in the “nature” room, which is decorated to make visitors feel like they are surrounded by nature. Calm and comfortable, Jackson said the room was designed to be a place where families can de-stress. The Region of Waterloo is improving safety on regional roads with education, increased traffic enforcement and planned changes to infrastructure. But a full solution takes all of us. Whether you ride, walk or drive, there’s no road safety without you. There are many great reasons to walk in Waterloo Region. Walking keeps us healthy, protects the environment and reduces traffic. To make sure every walk is a safe one, drivers and pedestrians need to be extra cautious at signalized intersections. This is where most pedestrian collisions happen. In Waterloo Region, rear-end collisions at intersections account for the majority of injury-causing collisions. Fortunately, they’re easy to prevent. When following another vehicle, take an extra second, keep your eyes on the road and give yourself plenty of space to stop. It’s that simple. Traffic signals are not safety devices, so you must be aware of your surroundings. Take an extra second to double check that the way is clear before you enter an intersection. Entering roundabouts is another frequent way that motorists collide. Did you know that, before you enter a roundabout, you have to yield to traffic in all lanes – not just the outside lane? Pedestrians, cyclists and vehicles in the roundabout always have the right of way. Take an extra second to yield smart and avoid a costly collision. Cycling Cycling is one of the most versatile ways to get around the Region. Since bicycles share the road with other vehicles, it’s important that we work together to create a safe space for everyone. There are some easy steps we can all take to eliminate injury. With 74% of cycling collisions happening at signalized intersections, drivers should expect cyclists at every traffic signal. Always check your blind spot before turning or changing lanes. When cycling, be sure to use the rightmost through lane (not the crosswalk). Make eye contact with drivers and be aware of traffic around you. Hallman Construction Limited, he has provided a model for local businesses looking to give back to their community. Building a caring and supportive community has been key to his lifetime work. Often described as humble, smart, innovative and compassionate, he continues to leave an unforgettable mark on the citizens of Waterloo Region. “It’s hard to believe that Jim hasn’t already received this award, given his incredible community support,” adds Dr. Jack Bishop, Citizen of the Year Committee Co-Chair. “The Lions Club of Kitchener is pleased to pay tribute to this dedicated and outstanding community leader.” The Citizen of the Year Award, hosted by the Lions Club of Kitchener, annually recognizes a deserving resident from the Kitchener and Waterloo area. The award was first presented to Ira Needles in 1957 and bus.cancer.ca. For more information on the Walking School Bus program in Waterloo Region, contact Colleen Cooper at 226-339-2021 or by email at colleen.cooper@ontario.cancer.ca. Drayton Entertainment Ticket Giveaway! Win two free tickets that can be used at any coming Drayton Entertainment 2019 season performance! Accessibility: This event is accessible for people with disabilities. Accessible parking is available. If you require assistance to attend or participate in this meeting, or to access information in alternate formats, please contact the Regional Clerk’s Office at 519-575-4400 at least five days prior to the meeting. Under the “Municipal Act”, personal information such as name, address, telephone number and property location that may be included in a submission, becomes part of the public record. Questions regarding the collection of this information should be referred to the Regional Clerk’s Office. Good News is News Too PUBLISHER/EDITOR Carrie Debrone debrone@sympatico.ca ADVERTISING SALES Rod Hoddle Carrie Debrone 519-578-8228 NEWS REPORTERS Helen Hall Carrie Debrone Shelley Byers CONTRIBUTING COLUMNISTS Zoe Avon Marilyn Lincoln Jack Nahrgang Peter Schneider GRAPHIC DESIGN Audra Noble Helen Hall Rosemount House Publishing Established 1996 Serving Kitchener East Independently owned and operated Copyright in letters and other material submitted to the publisher and accepted for publication remains with the author, but the publisher may freely reproduce them in print, electronic or other forms. was intended to impress you that I actually HAD social media feeds. The truth is, when I’m walking, I’m nourished by music, not likes. Just as great movies are enhanced by superior soundtracks, the visuals encountered on my long distance walks are heightened by apt sound selections. For instance, walking by an empty ION track would normally sadden me, but not when I listen to Dire Straits “Money for Nothing.” And passing by an empty storefront once made me worry about recessions, but not when Ray Charles belts out “Let’s Go Get Stoned.” After listening to Ray’s mellifluous track, I can envision a marijuana retail outlet coming to our fair city. Maybe. Now if you want to enjoy a fantasy without medicinal support, wander to the Stirling Street end of the Lakeside Park walking trail and look for an astonishing willow tree with a twisted and hollowed out trunk. When I stop to look at its splendour, and spool up the “Many Meetings” selection from The Lord of the Rings soundtrack, I can almost imagine an elf lodging in that tree. Of course, some of the best treks are in our own neighbourhoods. Where I live, the warm weather brings me into contact with our local bike gang, except these riders are sitting astride beribboned bicycles, not Harleys. You have not experienced true girl power until you’ve been forced off the sidewalk by adolescences using training wheels. Watching these laughing bikers sweep by is made even richer with Kelly Clarkson delivering her powerful “Miss Independent.” The birdsong from returning flocks can certainly provide sufficient melodies for our excursions, but selecting walking songs is more than a pleasurable activity. Music lowers levels of the stress hormone, cortisol, which is responsible for myriad health concerns. Who knows? Choosing varied soundtracks might just expand your destinations, promote spring route growth, and produce a welcome flowering of health. Jack Nahrgang recently retired from the Waterloo Region District School Board. He is a monthly columnist with the Kitchener Citizen. LETTER TO THE EDITOR as a Canadian, am tired of hearing of IDIAN everyone else’s history but our CANAhistory. Letters to the editor The Kitchener Citizen welcomes Letters to the Editor. All letters must clearly state the writer’s full name, address, phone number and be signed. Names will be published along with the letter, however, addresses and telephone numbers will be used only for verification purposes and will not be published. Letters should be submitted at least one week before the publication date. This newspaper reserves the right to edit, condense or reject any contribution for brevity or legal purposes. 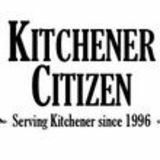 Invitation to be a guest columnist The Kitchener Citizen invites you to share your experiences of local community as a guest columnist. Do you have a rant? A viewpoint about a local event or opinion about an important issue? Or, do you have a personal or funny story? The Kitchener Citizen is looking for writers who are willing to share their views with their neighbours in a guest column. Columns should be 400-500 words long and submissions must include your name and contact information. To submit your column by fax, email or mail, please call 578-8228. For more information contact, Carrie Debrone, editor, 578-8228.
interest. Many people in our community and throughout Canada are burdened by heavy costs because of variable prescription coverage. In the previous budget, we announced the creation of the Advisory Council on the Implementation of National Pharmacare. This year, as we wait for the final report by the Council, our government is moving ahead with the initial steps put forward by the Council’s consultations. These measures will make sure that no Canadian will face the difficult decision between paying for prescriptions, heating their homes or putting food on their family’s table. To learn more about the work I am doing here in the riding and in Ottawa, please visit my website, www.RajSainiMP.ca, email me at Raj. Saini@parl.gc.ca, or call me at 519-741-2001. We Want To Hear From You On These Upcoming Projects/Events In Your Area The full details of any notices are available on our Public Notices webpage at www.regionofwaterloo.ca; click on the Public Notices link in the top right of the homepage. If you have any trouble viewing this information or wish to obtain a full copy of any Public Notice, please contact the Regional Clerk’s office at 519-575-4400 or email regionalclerk@regionofwaterloo.ca. Change in Council Meeting Time Please be advised the Regular Council meeting for the Regional Municipality of Waterloo scheduled for Wednesday, April 17, 2019 will be starting earlier at a time to be determined between 4:00 p.m. – 6:00 p.m. in the Council Chamber, 2nd Floor, Regional Administration Building, 150 Frederick Street, Kitchener. For more information or to register as a delegation, please contact the Regional Clerk’s Office at 519-575-4400 or email regionalclerk@regionofwaterloo.ca. Barbecues become hot issue in some condo’s Q. Our rules say barbecues are not permitted. Some of the owners try to disguise their barbecues by covering them up. I’m becoming very annoyed because I can’t even open my windows sometimes because of all the smoke. What can I do to resolve this problem? A. It is imperative that prospective buyers read their condo rules prior to purchasing. Some owners may feel it is quite safe to barbecue on the balcony, but the condo rules in some communities will state otherwise. Some owners cannot understand what all the fuss is about and why someone would try to prohibit a favorite summertime activity. There are two important reasons why barbecues are prohibited on a balcony. One is a potential fire hazard and the other is environmental. Strong cooking odors along with thick smoke will definitely drift into a neighbor’s window or common areas, including hallways where smoke detectors will be activated. There are also laws concerning the transporting of propane through a hi-rise building that only complicate matters further. Propane tanks or cylinders must be stored in a safe place away from dwellings. Propane cylinders must be transported in a service elevator, or when there is no service elevator, the person must use the passenger elevator alone to transport the cylinder. barbecuing begins so at least one board member can witness the infraction to confirm who is breaking the rules. Immediate steps should be taken by the board of directors in order to rectify this violation and avoid additional barbecues. Since most people do enjoy barbecuing, the board should try to compromise. Maybe there is a common area that can be set up for those who want to barbecue. Giving owners a choice is the key to a happy, healthy condominium community. Good Luck! Marilyn Lincoln is a condo owner, director and author of The Condominium Self Management Guide 2nd ed. Email: marilyncondoguide@hotmail.com with questions. Peter is a licensed Sales Representative with Re/Max and has specialized in the Stanley Park area for 32 years. on their new purchase. Right now we are still in, what is considered, a Sellers market. But soon I can see the pendulum swinging back to a more balanced market. This will be a better, fairer market for both buyers and sellers. If you would like to know how much your home has jumped in value over the past few years, call me at my office 519-888-7110 or my e-mail peter@takemehome.ca. You might be surprised. Beautifully renovated home located on a walk-out lot backing onto parkland. Everything inside is new in the past 18 months. New kitchen and bathrooms, new flooring and paint, new trim and doors, new furnace and central air. There is an in-law set up or great recreation room with wet bar. You’ll be impressed! Clean, totally renovated Legal Duplex with full walkout basement. Each unit has a separate entrance and insuite laundry. The upstairs 3 bedroom unit is rented for $1600 plus utilities, new flooring and paint throughout. Walk out to large Balcony that overlooks the yard. The Lower unit is full walkout with large Bright windows, plus a large 3 season screened in porch. Inside is a new kitchen with stainless steel appliances, gas fireplace in the living room and open concept design. The units have central air and gas furnace. Basement is rented for $1175. Both tenants have leases. For a free in home market evaluation in your area, call me at 519-888-7110. *Price and closing date to be agreed upon by Peter and the seller. to be able to get some 3-pitch teams playing some exhibition games in the books as early as April 27. Once things get rolling, each of the organization’s teams will generally have two games scheduled each week right through until June 22 — just before school breaks for the summer. Lots of games in a short period of time! ties covered by the review can share their thoughts on how we can improve regional governance,” it states. For details on how to comment on local governance visit ontario.ca/regionalgovernment The region will hold a special council meeting about the government review on Wed. April 17 at 7pm, in the Regional Council Chambers, 150 Freerick Street, Kitchener. Anyone wishing to speak as a delegation at the meeting can contact the clerk’s office at 519-5754400 before 4:30pm on the Monday prior to the meeting or email regional clerk@ regionofwaterloo.ca. Delegations will have a 5 minute time limit. ball, two levels of t-ball and 2 levels of 3-pitch so there’s an appropriate activity for children aged 3 – 13 in 5 overlapping age brackets. Having the capability to concentrate games in close proximity to each other minimizes logistics problems for families with multiple participants --- both players and volunteers. Registrations are still being accepted for the 2019 season but now, as team numbers have been set, registration is on a first-come basis to fill open roster spots. Visit the Club’s website for more information and on-line registration: www.stanleyparkoptimist.com. Excluding tires, some restrictions apply, please see us for details. Saturday, May 11, 2019 7:30 a.m. to 3 p.m.
stay together for long because once safely home, the young cranes will be pushed away to make way for new young. And so the cycle begins again. for life. If your dental hygienist has made a real difference in your life, consider nominating them as a healthcare superhero at dentalhygienecanada.ca/healthcaresuperhero. lowing changes in our mouths: • Alterations to the colour or texture of gums, cheeks, lips or tongue • Mouth lumps or sores that do not heal within 14 days; • Chronic sore throat or cough; • Difficulty swallowing; • Lumps in the neck, including those that aren’t bothersome; • Mouth or ear pain. Tobacco use, alcohol consumption, sun exposure to the lips, and the human papillomavirus are all known risk factors for oral cancers. By modifying our lifestyle, ensuring that our children receive the HPV vaccine, examining our mouths for suspicious changes, and scheduling regular dental hygiene visits, we can reduce our risk of illness. Find tips and tools to help you check your mouth for oral cancer at dentalhygienecanada.ca. Protect your pearly whites at home in 5 simple steps (NC) Dental hygienists, our partners in disease prevention, know that good oral health is essential for overall health and well-being. They show us how to take care of our teeth and gums at every appointment and encourage us to commit to a consistent oral hygiene routine at home. Five simple steps is all it takes: 1. B  rush teeth at least twice a day with fluoride toothpaste. 2. Clean between teeth daily. 3. R  inse using an antibacterial mouthwash once a day. 4. M  ake healthy food and beverage choices. 5. Eliminate tobacco use. Coupled with regular dental hygiene appointments, your home oral hygiene routine can offer powerful protection for your pearly whites. Neighbours meeting at the Cherry Park Neighbourhood Forum in March 2017 to talk about being active in their community and about how to unleash the power of neighbours. This event, co-hosted by the Cherry Park Neighbourhood Association and the Social Development Centre was the result of the Neighbourhood Connections Award that they won at the Festival Celebration in the Fall of 2016. The Neighbourhood Connections Award has had a Deep Impact in Neighbourhoods across Kitchener The Neighbourhood Connections Award was introduced in 2000 by the Social Development Centre to inspire neighbours to improve social cohesion and the quality of life for everyone. This award is presented annually at the Festival Celebration in November to a neighbourhood that expresses a clear wish to connect people of different backgrounds and involve neighbours across diversity. With this award, the Social Development Centre facilitates an engagement process and addresses neighbourhood concerns about equity and community capacity. The solutions that arise are as varied as the neighbourhoods themselves. Valley View neighbours connected youth and adults in a photo-voice exploration of their community. Cherry Park built connections between long-standing residents and families new to the neighbourhood. Traynor-Vanier neighbours worked to build solidarity across culture and language to improve safety and property standards in their buildings. This is just a small sample of the sorts of solutions that have emerged over the years in other neighbourhoods. Victoria Park Neighbourhood is this year’s winner of the Neighbourhood Connections Award. They are exploring ways to strengthen the social cohesion in their neighbourhood around equity and inclusion. Kitchener’s Festival of Neighbourhoods encourages everyone to organize inclusive activities in their immediate neighbourhood. Contact us for tips and resources in Kitchener to help bring your neighbours together and to ensure that your activity qualifies your neighbourhood for the $20,000 capital improvement grant draws. Register your inclusive neighbourhood gathering (held between October 1st, 2018 and September 30th, 2019) with the Festival before October 5th, 2019 and join us at the Festival Celebration at Kitchener City Hall on Sunday, November 17th from 1:00 to 3:00 p.m. when the draws for the $20,000 neighbourhood grants will be held and the winners announced. Several Waterloo Region high schools took part in the commemeration of the UN International Day for the Elimination of Racial Discrimination held at Kitchener City Hall on March 21. Carla Beharry, who began mentoring women and girls in Guyana, Belize and Trinidad and Tobago 16 years ago, spoke with students about self love, youth identity and inclusivity during the full day event. You get just one funeral. You are unique. Your life is unlike any other. By pre-planning your final arrangements now, you can decide how you want to be remembered. planning to build a green- and install the greenhouse house to support the Meals on a new concrete pad just on Wheels program offered steps from CSC’s kitchen, acby local charity Community cessible raised herb bed, and Support Connections – Meals garden. on Wheels and More (CSC). “Every year we work to CSC built its own kitchen give back to the community over four years ago, where it that has helped make us sucinvites volunteers in and accessful, and this opportunity Member of Parliament, Kitchener-Conestoga cepts fresh, local food dona- just seemed like a great fit,” tions making the program said Jamie Adam, President Member of Parliament, Kitchener-Conestoga Country Hillyears Drive, 2A Craftsmen Ltd. more 153 sustainable. Two ofUnit Pioneer ago it Kitchener, also built a kitchen gar“Collaboration is one of our ON N2E 2G7 Hill Drive,core Unit 2A which is why we den on153 site toCountry further increase values, 519.578.3777 fresh,Great local content ON inBird its N2E meal are so excited about this projKitchener, 2G7 Backyard Count - February 15 to 18, 2019 www.HaroldAlbrechtMP.ca programs. ect. We built the greenhouse, The Great Backyard Bird Count (GBBC) is a free, fun, and easy event 519.578.3777 that engages bird watchers of all ages to count birds to create a real-time www.HaroldAlbrechtMP.ca snapshot of bird populations. Participants are asked to count birds for as • Basic advanced little as 15 minutes (or as long as &they wish) onfoot onecare or more days of the • Trimsightings & file toe nailsat birdcount.org. Anyone four-day event and report their online Skin,beginning corn & callous management can take part in the GBBC,•• from bird watchers to experts, and Diabetics welcome you can participate from your backyard, or anywhere in the world. Each • Veterans welcome checklist submitted during• the GBBC helps researchers at the Cornell Home visits available Lab of Ornithology and theLinda, National The Audubon Society learn more about Foot Nurse how birds are doing, and how to protect them and the environment we 519-589-4470 share. Last year, more than 160,000 participants submitted their bird Heber, RPN Foot Care Nurse Our pharmacy is Linda staffed observations online, creating the largest instantaneous snapshot of Nursing Foot Care Educator with Certiﬁ Geriatric global bird apopulations recorded. Please visit the officialFreewebsite Foot Careedever Certified Master Pedicurist Parking at birdcount.org for more informationinand be sure to check out the latest Pharmacist specializing educational and promotional resources. dispensing medications and counselling older patients about their medications. 65 University Ave. E Waterloo Our pharmacy is staffed Fax: a(519) with Certiﬁ746-3788 ed Geriatric• Tel: (519) 746-6133 Pradeep Acharya, B.sc Phm, Rph, CGP Pharmacist specializing in Certiﬁed Geriatric Pharmacist www.kwpharmacy.ca dispensing medications and counselling older patients about their medications. said Adam, “We applied the same principle to the greenhouse. We were alerted to a unique need in the commuArbor Memorial Inc. nity and couldn’t wait to get involved. It’s been a great experience, with the help of volunteers from our suppliers and staff, and we’re pleased with how it turned out”. Interested volunteers and corporate groups looking for a great team building opportunity can call CSC at 519772-8787 and ask to speak to a member of the Volunteer Team, or apply online at cscmow.org. Call 1-855-831-8151 or visit www.OntarioElectricitySupport.ca to see if you qualify. Trim Size: 17" x 11"
NOTES: THIS IS NOT A COLOUR PROOF. Refer to pantone chips and process match books for accurate colour samples. No trapping has been done to this file. Our artists have done everything possible to make this file mechanically perfect. However, before signing approval please check all copy, dimensions and colour space. down the halls Thealking work W of hard Sunnyside Home of in Canada’s seniors built this country. Kitchener, the bright purple, blue and red resident room doors are just one sign of changes being made to help residents with dementia live their best lives. Sunnyside’s new approach to care is called Still ME. It involves making resident rooms and common areas feel more like home. Staff are also trained to engage with residents in meaningful ways and create regular opportunities for residents to feel joy and purpose. This helps remove triggers that cause residents with dementia to feel distressed, improves their Member of Parliament, Kitchener-Conestoga quality of life and reduces burnout for staff. 153results Country Hillseen Drive, Unit 2A Positive can be in residents like Bill, a forKitchener, ON N2E 2G7 mer mechanic whose cogni519.578.3777 tion and memory have improvedwww.HaroldAlbrechtMP.ca since changes were made to the sitting area near his room. The area now has a work bench, can crusher, and photographs of classic cars on the walls. “I’m going June 5, 2014 to make this my garage,” he said, as he chatted with staff about fond memories he has Our pharmacy staffed of working on a cariswith his brother. with a Certiﬁed Geriatric “Many peoplespecializing who move in Pharmacist into long-term care worry dispensing medications about the things they may counselling older haveand to give up,” said Connie Lacy, Seniors’ Services patients about their Director. “We don’t want peomedications. ple to feel that way. We want them to feel like their life is enhanced, not compromised, 65things University and that the that wereAve. E Waterloo Fax: (519) 746-3788 important to them at home • Tel: (519) 746-6133 canPradeep continue to beB.sc important Acharya, Phm, Rph, CGP Certiﬁed Geriatric Pharmacist to them. We’re responding to www.kwpharmacy.ca the needs, interests and abilities of each individual we serve.” You are unique. Your life is unlike any other. By pre-planning Sunnyside will measure the your final arrangements now, you can decide how you impact of Still ME by looking want to be remembered. at rates of depression, falls, Call today to take the first step: 519-804-4813 and the use of antipsychotAsk us about your FREE Planning Kit! ics, as well as how socially engaged residents become. It Memory Gardens Funeral Home & Cemetery by Arbor Memorial is also hoped the new model will help reduce sick time 2723 Victoria Street N., Breslau, ON • memorycemetery.ca among staff and lead to better job satisfaction. • Reading print? • Recognizing a familiar face? • With light or glare? In June of each year, we celebrate their contributions and thank them for the proud resilient nation Canada has become! anada’s seniors built this country. WHAT WE’RE READING A monthly column featuring great reads as suggested and reviewed by librarians from the Kitchener Public Library. Follow along each month and discover your next great read! think she often makes realistic choices. Author Hank Green definitely knows about Internet fame. He and his brother (author John Green) started a YouTube web series over 10 years ago which propelled them both into Internet celebrities. Since then, they have used this power to educate and promote positive messages, but not every person who becomes famous thinks about the messages that they are sending to their fans. The main downside of this book is that it ends on a cliffhanger. I am happy that there is still more to the story but I am also disappointed that I have to wait for the sequel to get certain answers. Otherwise, the plot moves at a good pace and the characters are diverse and interesting. Overall, I thoroughly loved this book. While the story is speculative in nature, the choices and events felt believable in the context and the plot felt engaging from the very beginning. I would recommend it for any adult or young adult readers who just want a taste of science fiction. ful career. From local bars to a European tour, McDonald has been there. Eventually moving to Kitchener, he started the Monster Jam at The Boathouse in Victoria Park, and has since moved to Rhapsody Barrel Bar on King Street, where you can see him every second Sunday starting at 4:30pm and meet the legend himself. He is always happy to meet new people. For a schedule of his shows, you can visit his facebook page Mike’s Monster Jam. It has a list of shows and guest performers. Kitchener Gospel Temple-Pentecostal 9 Conway Dr. (at River Rd), Kitchener (519) 894-5999 Sunday Service: 10:30am Mid-week activities for all ages. www.kitchenergospel.com Kitchener East Presbyterian 10 Zeller Drive, Kitchener (519) 748-9786 Reverend: Mark S. Richardson Sunday Service: 10:30am Nursery and Sunday School provided Sonshine Corner, Thursdays from 9:00 - 11:00am Holy Cross Evangelical Lutheran 322 East Avenue (at Stirling), Kitchener (519) 742-5812 www.holycrosskitchener.org Sunday Service: (Sept. - June) 8:30am and 11am, (July-Aug.) 9:30am 9:45am - Sunday School, Youth & Adult Bible Classes Choirs - Stephen Ministry - Youth Group - Beginnings (0 -3 years) Hope Lutheran 30 Shaftsbury Drive, Kitchener (519) 893-5290 Worship Service Times :10:00am Worship Service Sunday Morning Fellowship & Bible Study 11:15am Adult Bible Study 11:15am Sunday School (JK –Grade 12) Breslau Evangelical Missionary Church 102 Woolwich St., Breslau (519) 648-2712 Sunday Worship Service: 10:00am Children’s Ministry - Youth Ministry - Small Groups All are welcome! Visit us at www.bemc.ca Stanley Park Community Church 9 Dreger Ave., (at Ottawa St.) Kitchener (519) 893-8186 www.stanleyparkchurch.ca Pastor: John Pearce Sunday Service and Kid’s Church: 10:00am ALL WELCOME! news. Kiwanis Park is an amazing local destination park and I hope everyone enjoys the new huge beach-like pool this summer. We are also just finishing up the public engagement for a significant new playground in the park. While I don’t know the results yet (residents were asked to choose from three great options) the play structure should be completed in time to enjoy this summer. We’re looking for Kitchener’s Senior of the Year. You can nominate someone by searching Senior Of The Year at kitchener.ca or by picking up a paper copy at the Rockway Centre. survey will be shared with the public, the premier of Ontario, the minister of municipal affairs and housing, the regional government review advisors, all regional MPPs and all local heads of council. To participate in the survey sign into “Engage Waterloo Region” and proceed to the Kitchener section. I encourage everyone to participate as this will give Council some direction as to the desires of our constituents. I have been personally involved at the Local Government sector for over 50 years. In a future article I will share my thoughts on this topic which has been debated many times over that period. I look forward to hearing from as many as possible in the near future. standard for spending on future leisure and recreational facilities for the next 5 to 10 years. I did not support its adoption even though it is a superb document containing reams of information; because it virtually has no information as to the COST of these facilities. Staff continue the process of asking the Public what they would like to have without ever discussing the cost of paying for these things. I recommended, without success, waiting until the Development Charges by-law was approved. All the “wants” were approved without the reality of payment being debated. In my opinion this is not acting with transparency for our taxpayers. Appleridge. On Saturday, April 27 from 2 to 4pm, please join me for an informal gathering at the Pioneer Park KPL. As your new Ward 4 councillor, I’m looking forward to creating new connections with residents of this ward and learning more about your interests and concerns in our Ward. As always, I’m happy to discuss your city interests and concerns. Contact me at 519-741-2779; email me at christine.michaud@kitchener. ca, and follow me on Twitter @ ward4councillor. Williamsburg Community Centre. Contact williamsburg.community@ gmail.com or info@huroncommunity. ca for more details. Catch Up with Kelly On Thursday April 25, 2019, I will be hosting “Catch Up With Kelly”, an informal open house from 7 - 8pm at Williamsburg Community Centre. This is a great opportunity for me to meet with you one-on-one to hear your comments, concerns and suggestions. Drop in or join in the conversation online @gallowaykelly #kellychat. The sunshine we are enjoying has been so welcome after the winter we have had! It’s wonderful to see people outside again chatting with friends and enjoying our beautiful neighbourhoods. the city each year, asking us to place traffic calming measures to slow down drivers. We asses these requests based on terms in our traffic-calming policy, and choose three streets each year for formal traffic calming studies. You may remember seeing some yellow and black flex signs called PED Zone signs in the middle of particular streets in our ward last summer. Their placement is part of the Seasonal Traffic Calming Program, and locations are chosen based on your feedback to me, and my observations in the ward. bring awareness to safety issues and add beauty to your neighbourhood through some creative measures, like painted crosswalks, intersection murals, boulevard planter boxes, neighbourhood lawn signs (i.e. Drive like your kids live here), and more. To get started, search for the “Neighbourhood Strategy” page on kitchener.ca, click on resident-led traffic calming, and click on the “Easy Steps Guide for Resident-led Traffic Calming.” You can also contact me for assistance or to talk about city matters at paul.singh@kitchener.ca or call my office at 519-741-2793. (LFMP). The recommendations was grouped into five main areas: existing leisure facilities commitments; investing in, and maintaining existing infrastructure; future leisure facilities and initiatives; funding models and partnerships. The purpose of the LFMP is to help the City of Kitchener to provide excellent recreational programs and services that nurture lifelong participation, access for everyone, sustainable environments, infrastructure and partnerships. I am happy to share that all 18 recommendations and key findings were approved! the city look at all potential funding sources to find ways to ensure the city can continue to invest in existing facilities and build new facilities, such as expanding Forest Heights Community Centre (FHCC). FHCC services approximately 62,700 residents and while this area is already well developed, surrounding areas like Ira Needles continue to grow, putting pressure on the existing centre. An expansion to FHCC would provide additional space for the city and community partners to deliver programs and services. months. Thank you for your invitations to have coffee with you and your neighbours, speak to Brownie and Girl Guide groups, school classes, and Ward 8 businesses. Our residents are interesting, informed and community minded! I wanted to highlight the contact information for our Corporate Contact Centre. You can reach them at 519741-2345 or by email at info@kitchener. ca. Connect with them about all our city services, including, downed trees, potholes, bylaw infractions, and issues the city needs to address quickly. work with any neighbourhood leaders or community minded residents in the areas around St. Mary’s Hospital and the Rockway Golf Course. Contact me if you would like to pitch any ideas. At the April 1st council meeting I tabled a motion asking city council to encourage the Province to continue their support to operate the Local Planning Appeal Tribunal’s Support Centre. I want to thank my colleagues for their unanimous support and for the residents who wrote letters, and/ or attended the council meeting. I am truly grateful. step, our neighbourhood liaison staff can help get the ball rolling. Congratulations to KW Art Gallery A big congratulations to the Kitchener Waterloo Art Gallery for being named in the top five finalists this year for the Premier’s Award for Excellence in the arts, adjudicated by the Ontario Arts Council. Come check out Culture Talk #3 featuring Heidi Reitmaier, as well as the grand open house post renovations on April 26th 10:00 -4:00.
through surveys and social media – about their service experiences and where they see opportunities for us to improve. And, we spent a lot time learning from staff about where they face barriers in delivering great service,” said Jana Miller, director of corporate customer service. “Together, they’ve painted a very clear big picture for how we need to improve services and make it easier to interact with the city.” Key review findings The most important factors influencing customer satisfaction include getting service in a reasonable amount of time, dealing with knowledgeable staff, and getting the answer they need the first time. The city must maintain a multi-channel approach (phone, in-person and online) to service delivery. Almost 70 per cent of citizens indicated that they continue to access city services in person or by phone. Six of the top 10 frustrating experiences identified by citizens involve getting or sharing information with the city. When asked why they experienced frustration when accessing city services, the most frequently cited source of frustration was ‘Not knowing who to reach/call/talk to answer my questions or inquiries.’ Kitchener staff also sought direction on the prioritization of e-services improvements and areas identified for service reviews to reduce red tape. An implementation plan will now be developed and the recommendations will form the bulk of the work of the corporate customer service division over the next four years. To learn more about customer service at the City of Kitchener, visit www.kitchener. ca/customerservice. *** Mayor Berry Vrbanovic’s column will return next month. SIMPLE RECIPES FOR A BUSY LIFE STYLE Celebrate April with the best-ever apple pancakes topped with local maple syrup. APPLE PANCAKES 1 1/4 cup all-purpose flour scant 1 tablespoon baking powder 3 tablespoons sugar 1/2 teaspoon salt 1/4 teaspoon ground cinnamon, or more to taste 2 large eggs, yolks and whites separated 1 cup milk, or half milk and half light cream 3 tablespoons melted butter or vegetable oil 1 cup peeled and shredded apples With a fork, stir together the flour, baking powder, sugar, salt and cinnamon. With a large spoon, stir in the egg yolks, milk and melted butter or oil, until well combined. Shred the apple, and add it immediately to the batter. Fold in the stiffly beaten egg whites. Heat a griddle over moderate heat until it is hot enough that a few drops of water sprinkled on its surface will scatter. Brush the griddle lightly with oil. For smaller pancakes, drop about 2 tablespoons of batter onto the griddle, and cook until golden on both sides -- a minute or two, turning once. Double the amount of batter to 1/4 cup for larger pancakes and stir in a bit of milk if necessary. Keep pancakes warm while you cook the remaining batter. Serve with lots of the season’s first maple syrup poured over the top. Use lamb chops that are at least 1 1/2 inches thick, for best results. rub both sides of the chops with the onion and oil mixture. Place a bay leaf or two on top of each chop, and cover with another piece of waxed paper. Let stand at room temperature for an hour or two, or overnight in the refrigerator. (Bring to room temperature before cooking). When ready to prepare, place the bay leaves under the chops, and set the chops on a broiler pan. Preheat the broiler and place the broiler pan so the chops are about four inches from the source of the heat. Broil five minutes on one side, then one minute on the other, being very careful not to overcook. The chops should remain pink inside. Very good with chutney. If you mix your own curry spices, these biscuits will be quite outstanding. If you need to use a commercially prepared curry powder, then try to get the best quality that you can. A hot Madras curry is very good. CURRY-CURRANT BISCUITS 3/4 cup fresh lard or butter 1/4 cup sugar 1 cup buttermilk 3 cups cake flour 1 teaspoon baking soda 2 teaspoons cream of tartar dash of salt 1/2 teaspoons garam masala, or curry powder 1 cup currants Cream together the lard or butter and the sugar; beat in the milk. (If you do not have buttermilk, place 2 tablespoons vinegar in one-cup measure, and fill to the one-cup mark with sweet milk. Allow to stand for a few minutes before using. With a fork, stir together the flour, baking soda, cream of tartar, salt, curry spices and currants; using a wooden spoon stir the dry mixture into the milk mixture until well blended. Using a heaping tablespoon of dough for each biscuit, place unbaked biscuits a few inches apart on greased baking sheets. Bake at 375 degrees for 15 minutes, or until done. Serve hot from the oven, with sweet butter. Also good at room temperature. Each summer thousands of children join us to participate in their favourite active games and enjoy our creative crafts, while making friends, having fun and enhancing their interpersonal skills. The City of Kitchener Neighbourhood Camps are delivered at various community centers and local schools; all locations are proposed and subject to change. For information call 519-741-2200 ext. 7389. Camp leaders are trained in Standard First Aid and police screened. Science, Technology, Arts, Engineering, Mathematics July 22 to July 26 9 a.m. to 5 p.m. • $165 Book today! ALSO ENROLLING FOR OUR 25th SEASON Our kids & youth acting company offers year round opportunities to participate in workshops and full scale drama and musical theatre productions. • Cost: $  fee includes Friday lunch & free t-shirt • Private facility • University student counsellors • Extended hours available Multiple child/week discounts apply for a family purchase. See online for details. Rock Climbing, Tennis, Biking, Colour Nations, Archery, Beach Volleyball, Games & More... CONTACT US TODAY! Reitzel.com to reserve your space. THANK YOU SUNNYSIDE VOLUNTEERS! - During National Volunteer Week, Sunnyside recognizes its 225 volunteers for making a difference in so many ways. Together in 2019, you spent over 19,700 hours helping older adults we serve live their best life. Thank you. WORTH A SECOND LOOK – The Working Centre’s thrift store, 97 Victoria Street North, Kitchener is looking for donations of clothing, books, current magazines, craft and art supplies, sporting goods, housewares, furniture, jewelry, purses, backpacks, hygiene products, pictures, frames, music and movies, radios, stereos, CDs, DVDs, toys and games. The retail outlet’s goal is to provide the community with low-cost used furniture and assorted houseware items while keeping reusable goods out of landfills and creating opportunities for employment. Open 9am to 5pm weekdays and 9am – 4pm Saturdays. To donate call 519-569-7566. SCHWABEN CLUB EVENTS - Saturday, April 19, 2019 – Good Friday Fish Fry – at the Schwaben Club. Choice of Fish, Schnitzel, Vegetarian Lasagna. 11am to 8pm - Takeout available. Groups of 6 or more should call our office to make reservations. Saturday, April 27, 2019 – Spaghetti Dinner with Silent Auction – at the Schwaben Club. Fundraiser for the Kinder/Jugend Gruppen. Hall opens 4:30pm. Dinner at 5pm Tickets - $15.00 (includes Dinner and Desert). Sunday, April 28, 2019 – Filmnachmittag – Schwaben Club Keller – “Zei Matrosen of der Alm“. Film begins: 2:30pm, Coffee & Cake available. Doors open 2pm. Film starts at 2:30pm. For tickets and more information for any of these events, please call the Schwaben Club at 1668 King St. E. in Kitchener – 519-742-7979. ADULT DAY PROGRAM - Did you know Trinity Village has an Adult Day Program for seniors wishing to socialize with other seniors? The cost is just $8 per day and the program runs Mondays, Wednesdays and Fridays from 9 am to 1 pm, at Trinity Village Care Centre, on Kingsway Drive, near Fairview Park Mall. For more information call the Day Program Coordinator at 519-893-6320 ext. 235. 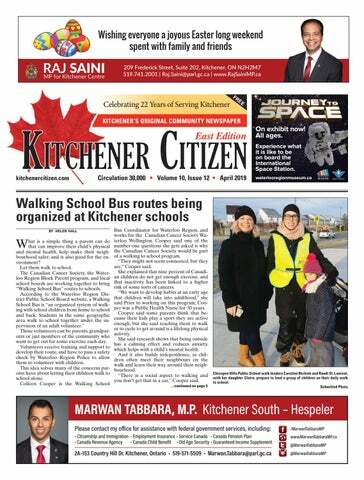 Kitchener's original community newspaper - established in 1996.